All Brian Hall wanted in his teens was to go to Liverpool, but not to play football. He wanted to study at the university. He studied Maths and graduated three years later with a Bachelor of Science degree. He was an industrious player who always gave his all for Liverpool. Hall was small in stature, but clever and a very efficient footballer. Bill Shankly liked those attributes. He became a vital part of the team Shankly rebuilt in the early 70s. Hall made two brief appearances as a substitute towards the end of the 1968-69 season and just one more, also as a sub, the following year. He managed to break into the team two years after his arrival when he replaced an injured Ian Callaghan on the right wing. He did such a good job that when Callaghan returned, Shankly moved Callaghan into a central midfield role to accomodate them both. Hall's most memorable moment came in the 1970-71 season when he scored the dramatic winning goal in the FA cup semi-final against Everton at Old Trafford which took Liverpool to Wembley for the first time since 1965. He can´t forget this important goal: "It's not so much me remembering my first-ever goal for Liverpool. I´m not allowed to forget it. To score it at Old Trafford in an FA cup semi final against Everton, and it turns out to be the winner, is not a bad memory. In fact, things dont´t come much better than that do they?" Hall had to settle for a runners-up medal on that occasion but was a member of the side that lifted the trophy three years later to add to the League Championship & UEFA cup winners' medal he had from the previous season. His non-selection for the first leg of the UEFA final against Monchengladbach was bizarre in that he had started the game which was abandoned due to a torrential downpour. When the final was replayed the following evening, Toshack was preferred to Hall from the start, although Hall did come on for Steve Heighway later in the evening. 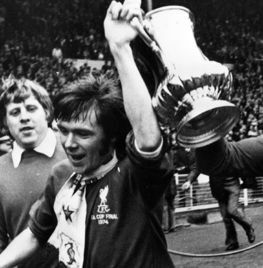 Hall played a big part in the FA cup fortunes of Liverpool in 1974. Again Liverpool were in the semi final. Liverpool and Leicester City drew 0-0 at Old Trafford and the replay was set at Villa Park. Hall scored Liverpool’s first goal soon after the start of the interval. He had just finished celebrating when Glover equalised two minutes later. Kevin Keegan and John Toshack guaranteed a 3-1 victory and Newcastle were an easy prey in the final. Brian played in all but seven of the League matches in 1974-75 but found his midfield position taken over by Jimmy Case before the half-way stage of the following season. He moved on to Plymouth Argyle in the summer of '76 before returning to the North-West and finishing his playing career at Burnley. He later regretted his decision to leave Liverpool: "I made a big mistake." Hall took on teaching and was a schoolmaster for a while. Hall returned to Anfield in 1991 to head the club's Public Relations department.